The most important accessory in a home bar is probably a bottle opener that any bartender should have in his bar kit. However, although you may own several of them, you can never find one around when you need one. And, there are so many options and types of bottle openers, that one is spoilt for choice and it can be quite confusing to buy the right one. 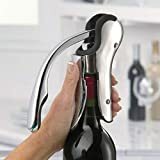 Like we make use of a corkscrew to remove corks from wine bottles, bottle openers are devices that are used to remove bottle caps which are made of metal, from all kinds of bottles. Bottle caps are usually smooth and flat on the top and are pleated or crimped around the bottom edge. Typically, the bottle opener is placed under the pleated or crimped edge and is utilized as a lever to pry the cap off. What Kind of a Bottle Opener Should You Buy? 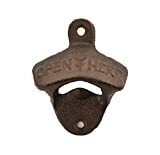 The first bottle opener was invented and came into existence in 1738, although the inventor of this device is not known. The bottle opener received its first patent in the year 1894. When it was invented, the bottle opener was very basic in terms of the design. It had a solid handle and a circular or a rectangular opening at the end, which was used to open the bottle caps. In the period between 1910-1920, bottle openers with animal or human figures became quite popular and these bottle openers were used as mediums of advertising. Around the 1920s, multi-tool and multi-functional bottle openers were invented, which had many other useful tools like knives, nail clippers, etc. along with the bottle opener. To put it simply, a bottle opener should open bottles efficiently. 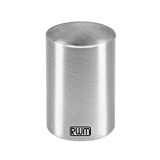 It should be sleek and compact that can be stored easily in your drawer or in your pocket so that you can whip one out quickly when you need to open a bottle. A bottle opener should be easy to hold and use. Avoid openers that have sharp parts and those with thick handles. A good bottle opener should enable you to pop off the caps of many bottles in just a few seconds. 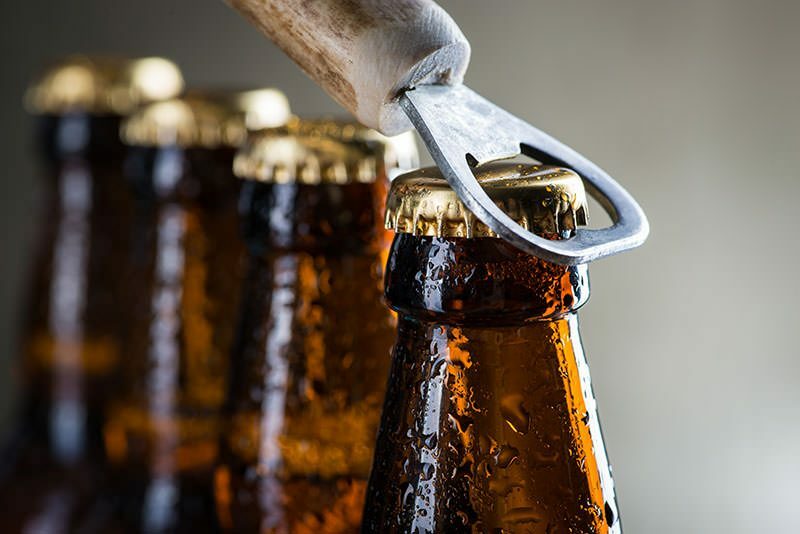 Choose bottle openers that are sturdy and heavy-duty, which are made of stainless-steel or any other tough material to withstand rough and regular use and will not break off the bottle tops. Here, we have reviewed some of the best bottle openers, so that you can evaluate the features and decide on the one most suitable for you. If you’re looking for a hot “conversation piece” at your parties, then you should consider the 50 Caliber BMG Real Bullet Bottle Opener, which you can use to open your cold beverages, as well as your party conversations. The 50 Caliber Real Bullet Bottle Opener is a handmade piece made from authentic brass casings which have been procured from the U.S. Department of Defense. Every 50 Caliber bottle opener is made from a 5.5-inch polished BMG (Browning Machine Gun) brass casing that has been genuinely fired by the military. The 50 Caliber bottle opener is precision cut to open bottles which are polished by hand and lacquered to give them a top-class, mirror finish that does not tarnish over time. What’s more? You can customize your 50 Caliber bottle opener with a personalized engraving of your choice of one line of text (around 25 characters). The bottle opener comes in a velvet bag that makes it a great option for gifting or can be used for storage. May not have an angle sufficient to open bottles easily. Since the bottle opener resembles real ammunition, it may not be permitted in places such as airplanes, schools, etc. As the bottle opener is made of live casings that were fired, they may have minor scratches and blemishes. So, if you want to own a piece of U.S. history at a very affordable price, then the unique 50 Caliber bottle opener is a wonderful buy. Made with extreme precision and craftsmanship, the bottle opener is an excellent accessory to get your parties going or a great bottle opener to gift someone special. Irrespective of the type of bottle you want to open, the LDesign Stainless Steel Automatic Bottle Opener is ideal for any kind of bottle that has a cap, be it soda bottles, soft drinks or beer bottles. 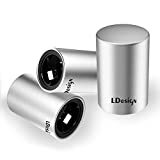 The LDesign Bottle Opener is automatic and the “pop the top off” design allows you to just push the device down, you can get the caps off easily and quickly in just 3 seconds. Made of premium-quality 304 stainless-steel with an anti-rust shell that is also scratch-resistant, the bottle opener is durable and long-lasting. The ergonomic design of the bottle opener makes opening bottle caps effortless. The compact size of the bottle opener makes it perfect to carry around in your pocket and for use at picnics, camping trips, parties, in your home bar or kitchen. You can now remove the bottle caps without bending or damaging them, which makes the LDesign Bottle Opener a great tool for those who love collecting bottle caps as a hobby. And, the product comes with a 1-year “no hassles” warranty. Automatic and ergonomic bottle opener. Makes removing caps super-easy and quick (in just 3 seconds, faster than any other bottle opener). May need many attempts to get the bottle cap off. If not placed properly, the bottle opener may get locked and may require being forced off. 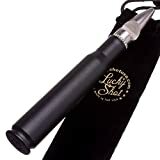 So, if you’re looking for a cool bar accessory to open your bottles at home, a party, in a bar, store or restaurant the LDesign Bottle Opener is a great buy. Also, the elegant and contemporary design of the LDesign Bottle Opener suits any type of décor and looks aesthetic on any kitchen or bar counter. 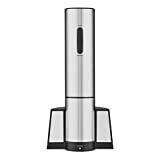 If you’re looking for an automatic beer bottle opener that is sure to simplify your life, then the ICCKER Automatic Beer Bottle Opener is a great gadget to consider for your home bar. This high-quality magnetic bottle opener is manufactured out of food grade 403 stainless-steel with a brushed shell and this combined with the internal metal gear, makes the ICCKER Bottle Opener extremely sturdy and durable. The high-precision construction of the bottle opener improves the success rate of opening caps by 30 percent. Now the caps are easy to “pop off” without twisting your wrist and causing any wrist or finger pain. The bottle opener is small and compact, which allows you to store it easily and carry around in your pocket. sleek and elegant design of the ICCKER Bottle Opener makes it a great accessory for any bar or kitchen. The bottle opener comes with a 2-year warranty. Compact bottle opener allows easy storage and lets you carry it around conveniently. Magnet design of the opener allows it to catch the bottle caps easily. Gets stuck on the bottle cap. May not get the cap off all at once and may require a few tries. The ICCKER Bottle Opener is the perfect workmate if you’re a bartender or a server at a restaurant or a bar and a great accessory for your home parties too. The bottle opener is extremely easy to use and you can pop off bottle caps in a jiffy without straining your fingers and wrist. Moreover, the sleek and compact size makes the opener ideal to slip into your pocket for use at an outdoor party, while your camping, in your bar or in your kitchen. The choice of bottle openers is never ending and you can choose from a range of options from modern to antique and from simple to decorative types. It is a good idea to know the various types and options available, although personal preference is the main factor that essentially influences the buying decision. There are different kinds of bottle openers for specific categories of drinks such as there are specific type of openers for beer bottles, while there are other types of openers for cider, wine, ale, etc. And, for those who want to open many different varieties of bottles, you have multi-cap openers. 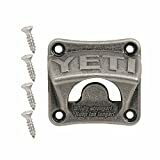 So, you must buy a bottle opener that is suitable for the kind of bottles you will be opening often and you’re all set to get the party started at home!